(i) He sat in front of the fire.....he liked its warmth. (ii) His stamp albums were full, .....he needs a new one. (iii) He collected space travel stamps.....his grandson's interest. (iv) .....having collected stamps for so many years, he still enjoyed the hobby. (v) It was getting more expensive to buy stamps ....., he decided to continue collecting them. (vi) He still preferred to collect British stamps.....they were not as colorful as Nepalese stamps. (I) My brother.....not much money at the moment. (ii) She.....an accident last year. 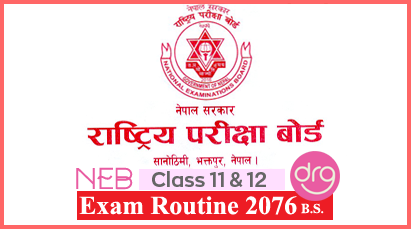 (iii) By next month he.....finished the exam. (iv) My friend is lucky; her parents.....television. (b) Discuss 'The Three Day Blow' as a dramatic story. (c) Do dreams have any connection to our real life ? Discuss your personal view. Also relate to the story 'The Recurring Dream'. Many African mothers carry, or nestle, their babies on their backs. This custom has advantages for both mother and child. A working mother who has nobody to look after the baby, knows he is safe on her back, while her hands are free for her work. Meanwhile, the baby stays in close contact with his mother and feels warm and safe. The sense of security may be suddenly broken, however, when the child can no longer be carried. He may be put down and expected to behave like a grown-up child. But he has been over-protected for so long through nestling that he now feels very insecure and may behave like a baby. Children need freedom and the chance to use their limbs. They need to be able to observe and explore their environment. They also need to learn how to make and do things on their own. Therefore even when mothers must carry their babies everywhere, they should try to set them free whenever possible. Moreover, in the hot months, the less back-nestling the better. Many women, however, prefer to carry their children all day long. They feel the children are safe, sleep longer, keep quieter and do not make a mess ! I once visited a friend's home where the mama-nurse was nestling my friend's eleven-month-old child. Seeing he was restless, I asked the mama-nurse to put him down. At first she didn't want to because she thought the child would make the room untidy. When she finally agreed I asked for some kitchen pots, spoons, unopened tins and boxes since there were no toys to play with. Immediately the child started examining them one by one. Then he started banging the pots and boxes with the spoons. The different sounds fascinated him. But mama-nurse didn't like the noise or the mess. (a) What is the advantage of carrying their babies on their backs for mothers and babies ? (b) Why does the child feel insecure when he is put down. (c) Why do many women prefer to carry their children all days long ? (d) Why did the mama-nurse refuse to put down her baby ? (e) How did the baby behave when he was put down and given some pots and other things ? (a) Imagine that, 50 years from now, someone in your class is very popular, write an account of his/her life. (b) Describe a place you last visited. Mention what facilities were there for visitors and what you did ? (c) Recently there have been complaints that the ways we celebrate our festivals have changed. Write a few paragraphs on a specific festival or a traditional activity showing the difference in celebrating it now and then. (a) Sita: Do you think you could lend me Rs. 500 ? (b) Madan: Would it be all right if I brought the children ! (c) Gita: Would you mind helping me with the washing-up ? (d) Shyam: Can I come too ? (e) Pasang: Do you mind if I phone my parents ? (c) We can't control our 16 years old son. (d) I can't get to sleep at night. (e) I'm madly in love with Maya, but she doesn't even look at me. (a) The tourist's purse was stolen. (b) Erica fainted at the party. 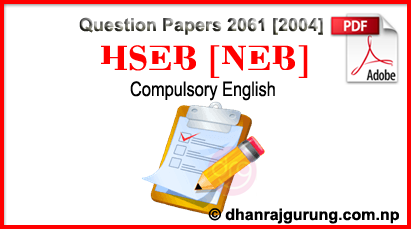 0 Response to "Compulsory English | Class 11 | Exam Paper 2061  (New Course) | HSEB"